The Christmas décor has been stored away, although in olden days it was traditional to keep the decorations up through the month of January, gradually feeding the pine boughs and evergreen roping, holly and ivy to the fireplace. However, every last leaf and pine needle must be removed from the home by February 1st, or terribly bad luck will engulf the house and its inhabitants. It’s not worth the risk, so if you haven’t put away holiday ornaments and greenery, do it now! We’ve had warmer than normal temperatures last month and colder than normal temperatures this month, with little snow cover to protect plants from below zero nights and frigid winds. They must be frightened, and wishing they had a warm blanket of snow. Fortunately for me, it’s time to seed violas and perennials. Just the act of planting those tiny seeds lifts my spirits with the promise of new emerging green in the coming days. I’m sowing extra numbers of perennials, just in case this hard winter takes its toll in the gardens. “Mellow Yellow” columbines, “Chim-Chimneerudbeckia,” “Viola Penny Peach Jump-Up”….just the names make me smile, as visions of flowers swirl in my head. Have you started planting? Indiana Hort Congress: Feb. 12-14. This is a good show, although much smaller than the one above, for anyone involved in farm markets or commercial crop production, wine, agri-tourism, food safety, and organic or greenhouse growing. Attend the entire conference, or go for 1 day. The trade show is worth seeing for packaging, production machinery, wholesale seeds, irrigation equipment, etc. Schedule and registration available at . Held at Indy Marriott East. HSCI Herb Symposium: Saturday, April 10. Fabulous event! Mark your calendar now. More info upcoming in future newsletters, but I can tell you that I’ll be speaking and showing how to use the Herb of the Year, Anise Hyssop in cooking. Plan to attend! January is National Hot Tea Month, National Mail-Order Gardening Month, and National Oatmeal Month! That is excuse enough to celebrate often with a cup of hot tea, oatmeal cookies or oatmeal cake, and a growing stack of seed catalogs to study on cold, cloudy days. It’s a good time to place those seed orders and replace broken garden tools. *The shape of a bell pepper tells what it is good for. Peppers with 3 bumps on the bottom are sweeter and will taste best raw. Peppers with 4 bumps are firmer and better for cooking. *Pantone’s color of the year is a pretty coral; Benjamin Moore’s color of the year is a soft gray. 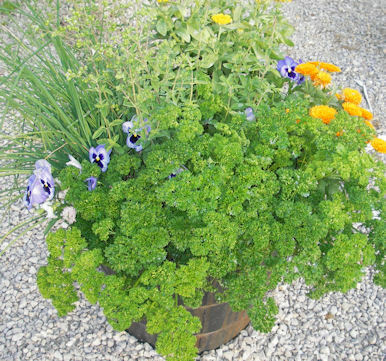 What herb garden could be complete without parsley? Without doubt one of the most used herbs in the kitchen, parsley is not only a source of lively, fresh flavor but of valuable vitamins (A, B1, B2, C and niacin, calcium and iron) as well. It has historically been used as a breath freshener, which is why a sprig is often placed on a dinner plate to be eaten after the meal is consumed. Recent studies indicate that parsley contains essential oils that inhibit tumor formation and is antimicrobial. And in addition to being beneficial to humans, parsley is a bountiful source of food for many beneficial caterpillars that become beautiful butterflies. A biennial, parsley (Petroselinum) is easy to grow in sun or light shade. Related to the carrot family, it does appreciate plenty of room for its fleshy root and grows a lush bouquet of leaves when given adequate moisture and nutrients. If left in the ground after its first growing season, parsley often returns in early spring. Those first leaves are tasty, but soon become more bitter and tough as the plant produces a tall bloom stalk. The flower umbels resemble those of dill or fennel, but smaller. I find them very useful as filler in bouquets. If allowed, the flowers will produce seeds that turn brown and eventually fall to the ground. If not eaten by critters, those seeds will germinate the following spring and produce another crop of parsley plants. If there are no self-seeded plants, then one will need to plant. Placing the seeds in a plastic bag in the freezer for a week will greatly enhance germination. Then simply sow them in small pots of potting soil, cover with a bit more, water, and place out of the way at room temperature. Parsley likes darkness to germinate, but as soon as the green sprouts show, move them into bright light. Like other umbelliferae, parsley dislikes having its roots disturbed and therefore resents transplanting. It is do-able when the plants are small, but growth will be faster if they are just grown in a small, deep pot (remember that “carrot” root!) and then moved into the garden once danger of frost is past. 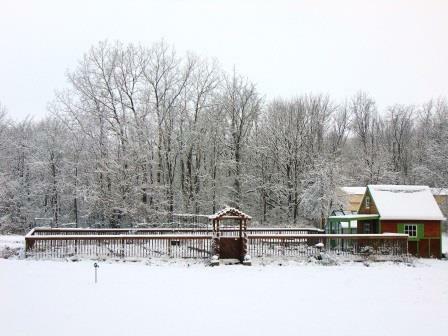 If plants have been carefully hardened off, they can survive light frosts. Do keep in mind that rabbits and other critters adore parsley as much as we do, and unprotected plants are likely to disappear overnight. Parsley is available in both a “curly” leaf and a “flat” leaf form. Culturally, treat them the same. In general, flat leaf parsley tends to be a bit taller. Some claim that the flavor of flat leaf is better, so it is often preferred by chefs, but I suspect that the ease of cleaning and chopping the flat leaves is more of a consideration than the flavor. Curly parsley is definitely more decorative, and the caterpillars show no preference. Curly parsley is so pretty that it is often used as an edging both in herb gardens and flower borders. Whatever type is grown, harvest the outer leaves so the center of the plant can continue to produce leaves the entire season. Harvesting often is actually good for the plant, so that stems and leaves do not get too tough. In Europe, parsley root or Hamburg Parsley is often grown and available in markets nearly year-round. It is used similar to parsnips, and in fact looks similar enough that I have often bought the wrong one! Its Latin name, “Petroselinum” comes from selinum, or celery and petros, or rock. Fresh parsley adds a delightful taste of spring to any dish, as well as brilliant green color. However, if you want to store parsley for the winter either freezing or drying it are the best options. Freeze in small quantities so only the amount needed requires thawing. Or chop and freeze in ice cube trays. Then a cube can simply be added to soups or stews. Otherwise, allow the cube to thaw in a small strainer so the water can drain away before adding to egg dishes or cheese balls, etc. Microwave drying will provide a supply of parsley that holds its color, while just hanging to air dry will result in bundles of beige. To microwave dry, simply rinse leaves and pat dry between paper towels. Remove leaves from the stems and place leaves on a dry piece of paper towel in a single layer, preferably on a large plate that can go in the microwave. Cover with another piece of paper towel and microwave for 15-20 seconds. Remove from microwave and flip onto another plate so that the top paper towel is now on the bottom. You may need to adjust leaves so they are in a single layer again, depending upon your flipping skills. Remove the now damp paper towel that was on the bottom and replace it with a fresh paper towel. Repeat until the bottom paper towel is no longer moist at all and the parsley is crisp. Allow to cool before placing the dried parsley in airtight jars or tins. Store in a dark, cool place. Do this in small batches and the earlier paper towels can be used again and again. Do grow parsley somewhere in your garden this year, and be sure to plant enough for both your family and the caterpillars! 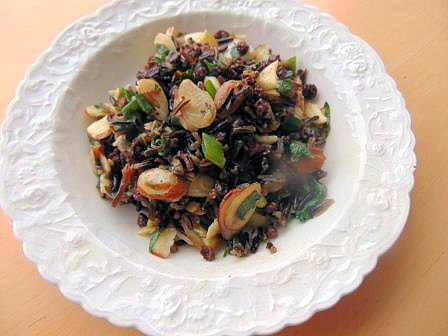 Make this entirely with wild rice, or use one of the wonderful blends of wild, long white, red, brown, black, etc. Lovely as a side dish with meat or salmon, or add some mixed greens and use it as a luncheon salad. Cook 2 c. wild rice according to package directions. (This should make about 4-5 cups of cooked rice.) Cool. In a small saucepan, mix 1 c. currants and 1 c. white wine. Bring to a boil. Remove from heat and let sit 20 min. Drain and reserve any remaining liquid. Meanwhile, chop ½ c. fresh parsley and slice thinly on the diagonal green onions to make 1 c. Set aside. Make a dressing by combining in a jar: ½ c. salad oil; ¼ c. red wine vinegar; 1 shallot finely chopped; 1 tsp. curry powder; 1/8 tsp. salt and 1/8 tsp. black pepper. Shake well and set aside. When ready to assemble salad, place rice in a large bowl. Add currants, parsley, green onions and 1 c. sliced almonds. Shake dressing well and pour over rice mixture. Stir to combine. Taste for salt and pepper. If salad seems dry, add reserved liquid from currants. Serves 6. This soup was inspired by one I had in Ireland! Heat 3 T. butter in a large saucepan. Add: 1 stalk celery, diced; ½ c. chopped onion, 1 clove garlic, minced. Sauté until tender, but not browned. Add 1 tsp. flour, stirring briskly until incorporated. Stir in 2 c. chopped parsley; 2 medium potatoes, peeled, quartered and thinly sliced; and 2 c. chicken broth. Cook until potatoes are tender. Add 1 c. Half & Half and freshly ground pepper. Heat just until hot, but do not boil after adding Half & Half. Sprinkle each serving with chopped garlic chives and chopped parsley. Makes 5 servings.